Faith Leitner will play her harp at the Florence Griswold Museum today. The sounds of yesteryear will welcome the new year today, Wednesday, Dec. 31, between 11 a.m. and 2 p.m. at the Florence Griswold Museum in Old Lyme. Faith Leitner will play a variety of songs filling the Krieble Galleries with the heavenly sounds of the harp, which was one of Miss Florence’s favored instruments. This event is included with Museum admission. The holidays are almost over and winter is now in full swing. Time for entertaining and planning what to make for New Year’s. I for one, do not love New Year’s Eve (does anyone over a certain age?) but my husband and I often make a gourmet meal and have a really good bottle of champagne (Veuve Clicquot, anyone?) and enjoy a quiet, cozy evening at home. I have many entertaining menus up my sleeve and focus heavily on appetizers as they are so creative and fun to eat. Here is a sample of one such menu that is sure to make your guests or maybe just your significant other happy. This recipe can be cut in half as well as frozen, both the shrimp and the sauce freeze well. If you decide to make this ahead and freeze the shrimp, do not defrost, simply drop them into the hot oil. 1. Combine the flour, salt and cayenne on a flat baking sheet. Place the egg whites and coconut on two separate baking sheets. Dredge the shrimp in the flour mixture, then the whites, then in the coconut. Press the coconut onto the shrimp. Chill for at least an hour. 2. Heat the oven to 200. In a medium saucepan heat the oil until moderately hot but not smoking. Working in batches, fry the shrimp until golden about 2 minutes. Drain on paper towels. Transfer to a baking sheet and keep warm in the oven. 3. In a processor combine the pineapple, scallions, apricot preserves, cilantro, lime juice, jalapeno and salt to taste. Process until blended and taste, adjust seasoning. 4. Serve the shrimp on a platter with the sauce in a small serving dish. Cook the bacon on a rack on a baking sheet in the oven until down but not crisp about 15 minutes. Drain on paper towels. Cut in half. Score the fat on the duck and season the meat side with salt and pepper. Heat a medium cast iron or stainless steel skillet over medium high heat. Sear the duck skin side down until golden brown about 5 minutes. Place the duck on a rack fat side up in a roasting pan and roast in the oven for 5 to 8 minutes. Transfer to a cutting board and cover to keep warm. Reserve the fat from the roasting pan. Heat a medium skillet and add 2 Tb. of the duck fat to the pan. Sauté the shallots and garlic for about 3 minutes. Add the wine to the pan and de-glaze, reduce the port to half and add the stock, reduce to about 2/3 cup. Add the vinegar and honey and cook until thickened. Season with salt and pepper and taste for seasoning. Remove from the heat. Slice the duck breast and arrange on a plate pour the sauce over and serve. Chicken breasts can be used in place of the duck. 1. Combine the arugula, endive and greens in a large bowl and toss. 2. Combine the lemon, Dijon and mint in a small bowl and whisk add the oil slowly while whisking, season to taste with salt and pepper. 3. Toss some of the dressing with the greens and reserve any leftover for another salad. “I have heard the rumors,” State Representative Phil Miller told ValleyNewsNow.com in a recent interview regarding State Senator Art Linares considering a challenge to Congressman Joe Courtney in the 2016 elections. Miller noted that the 2014 elections were tough for Democrats, citing the loss of 14 State Representative seats in the statehouse. Miller also commented that he, himself, had an uphill battle to survive the Republican sweep. 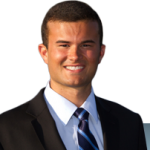 Linares’ spokesman, Adam Liegeot, said, “No,” however, when asked if Linares might challenge Courtney in the next Congressional race. Linares’ numbers in the last election were impressive. He beat his Democratic challenger, Emily Bjornberg, 22,335 to 17,046, out of a total 39,932 votes cast. The percentages were: 56 percent for Linares and 43 percent for Bjornberg. Most impressive about Republican Linares’ victory was that he won what was once considered a safe Democratic district. As for Courtney in the last election, he won his fifth term in office with landslide numbers against New London real estate agent Lori Hopkins-Cavanagh. Many considered the Congressman’s challenger weak, however, and state Republicans did not appear to mount a major effort to defeat Courtney. The Republicans already control the House of Representatives, 234 Republicans to 201 Democrats. Some might argue that if Linares were to become a member of the House Majority, he would be in a better position to help his constituents than Minority member Courtney. In the same interview, State Representative Phil Miller also commented on what he considered the negativity of candidate Bjornberg’s recent campaign against Linares. “People around here don’t like that,” Miller said. In contrast, however, it might be noted that the winning candidate for Governor, Dan Malloy, ran highly negative TV ads charging that his Republican opponent, Tom Foley, paid no taxes, and yet Malloy went on to win in what was, unquestionably, a tough year for the Democrats. ESSEX–Two weeks after a plan for lethal trapping of beavers at Viney Hill Brook Park drew dozens of residents to its December meeting, the board of selectmen have appointed four new members to the conservation commission. Selectmen last week appointed Robert Ward, Mark Reeves, and Frank Hall to the commission that oversees the town’s open space land. 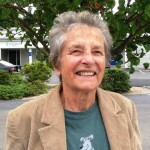 Jerri MacMilllian was appointed as a commission alternate. The appointments bring the panel close its full compliment of seven regular members and three alternates. One alternate position remains vacant. 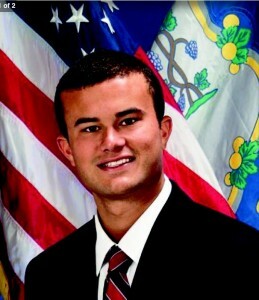 Hall has been an active member of the town’s clean energy committee. 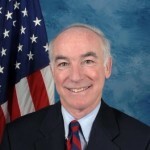 Reeves, a former Old Saybrook resident now living in Essex, was the unsuccessful Democratic nominee for first selectman of Old Saybrook in 1999. The commission was down to five members when it voted in November to authorize lethal trapping of beavers in a pond at Viney Hill Brook Park. The decision, prompted by reports of damage from beaver activity to trails and trees, drew strong opposition from dozens of residents at the commission’s Dec. 4 meeting. The commission later decided to further explore alternates and defer any action on lethal trapping. First Selectman Norman Needleman said all four appointees volunteered for vacancies on the commission in the days since the controversy over trapping of beavers. ESSEX— A 28-year-old Deep River man who had served as a local volunteer firefighter was killed Monday morning when his vehicle collided with a town street sweeper on Route 154. State police reported Anthony Camire Jr. was pronounced dead at the scene when a Volkswagon Jetta he was driving crossed the center line and collided with the sweeper operated by 27 year-old Ryan Welch, a, Essex public works employee. The accident was reported at 7:42 a.m. Camire was travelling northbound, with the street sweeper going southbound, when the crash occurred at a sharp curve just south of the Route 9 exit 4 interchange. 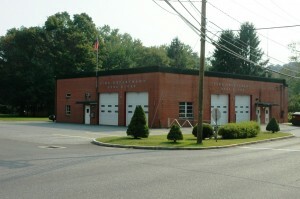 Camire, who worked as an electrician, had served as a volunteer firefighter with the Deep River and Chester volunteer fire departments. The accident remains under investigation by state police. ESSEX— Rick Audett has resigned from the town parks and recreation director position he has held for the past four years. His last day was Dec. 19. First Selectman Norman Needleman said Audet left to take a new job in New Jersey. Needleman said Mary Ellen Barnes, the department’s program director, would assume the director duties until the parks and recreation commission make a hiring recommendation to the board of selectmen for a new director. The salary range for the full-time 35 hours per week position is between $49,098 to $61,712, which was the salary Audet was receiving at the time of his departure. Barnes also has part-time duties as the town’s social services coordinator. She has been the German chancellor for 13 years, longer than any of her predecessors since the creation of the country in 1949. Forbes magazine puts her #1 on the world’s list of powerful women. The key to understanding Angela Merkel and the successful way she runs her government lies in her upbringing. She was born in 1954 in Hamburg. When she was three, her father – a Lutheran pastor – moved the family east of Berlin in order for him to head a home for mentally disabled children. Growing up in one of the most repressive countries in the world, she always feared being spied on by the East German State Security Service – commonly known as the ‘Stasi’ – and was careful not to put the life of her family in danger. No wonder the wire-tapping of her cell phone last July hit a raw nerve. Between a distant father and the dreary atmosphere of East Germany, she found security and stimulation in hard scientific work. She obtained a doctorate in physics and wrote her thesis on quantum chemistry. She also became an excellent Russian speaker — a skill she has used in her relations with Putin. Her Polish ancestry – her mother came from Gdansk (formerly Danzig) – will undoubtedly make her close to the new president of the European council, Donald Tusk. She is a shrewd politician, pragmatic enough to adjust to changes. She likes consensus and has accepted a coalition between her Christlich Demokratische Union (CDU – Christian Democratic Party) with the Sozialdemokratische Partei Deutschlands (SPD – Social Democratic Party). She treats politics like a science , taking a long time before reaching a decision, thus giving a comforting stability to her performance. She wants power, but hates being in the spotlight. This is why she preferred the “Merkozy” (Merkel-Sarkozy) days to being alone in dealing with the European Union. Merkel has a difficult task to accomplish. Her obsession with the rule of balanced budgets is creating austerity, which many members of the Euro zone now reject. Her policy is increasingly being criticized by economists. Emmanuel Macron, the new French Economic Minister, and Wolfang Schäuble his German counterpart, strongly disagree with her positions and think that growth is more important than austerity. Marcel Fratzscher, professor of macro economics and finances at the university of Humboldt, also thinks that the priority is to invest in the crumbling German infrastructure. Germany is perceived abroad, and particularly by the US, as carrying Europe financially. However, this assessment should be corrected by keeping in mind that the European Central Bank capital is made up of the contributions from the national banks. The Deutsche Bundesbank contributes 19.99 percent, Banque de France 14.1 percent, Banca d’Italia 12.3 percent and so on. The burden of the debt is shared by all the countries of the Euro zone. On Dec. 10, 2014, Angela Merkel was reelected by an astounding 99 percent of the votes as head of the CDU, which she has led since 2000. After a 10-minute-long standing ovation, the party members proceeded to enjoy three more days of the Cologne Congress. Today, an overwhelming 64 percent of Germans would like her to run for a fourth mandate as chancellor in 2017. 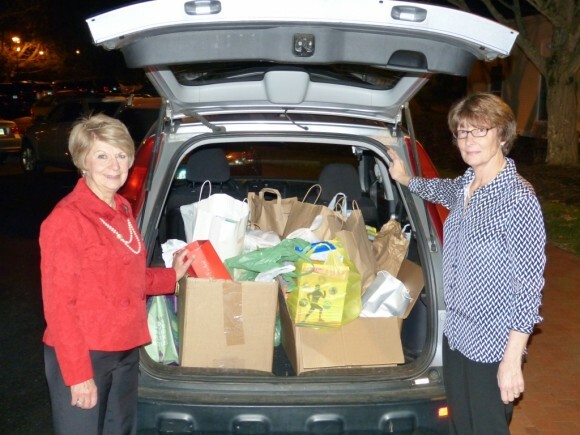 Pictured packing the food for delivery to the Shoreline Soup Kitchen and Pantries are Dianne Sexton and Carol Denham. Essex Garden Club members collected non perishable food items for the Shoreline Soup Kitchens & Pantries (SSKP) at the club’s annual festivities at Essex Meadows. Individual members and the club also donated $1,510 to the SSKP, which will be matched by the Gowrie Challenge. CHESTER— Wasting no time after receiving a $1 million state grant with a three-year timeline, members of the library board of trustees advised the board of selectmen Tuesday of plans to seek a town funding appropriation to prepare engineering design plans for a proposed new library at North Quarter Park. Trustee Terry Schreiber said the group, working with a volunteer building committee, would have a specific total for the funding request at the board’s next meeting on Jan. 6. Any appropriation of town funds, which is expected to be in the range of $100,000, would also require approval from the board of finance and voters at a town meeting. The appropriation would pay for preparation of a site plan and schematic design plans for a new library building at the park. The building committee was established by the selectmen last summer as part of an effort to complete the state grant application by an end of August deadline. The committee, with support from the selectmen, hired Lerners, Lads, & Bartells Architects, a Pawtucket, R. I. firm that has experience with library construction projects. Schreiber said the trustees and building committee have made no final decisions on the size of a new library, whether it should have one or two floors, or whether a community center component should be included in the project. The trustees are planning a public information meeting on the project for Saturday Jan. 10 at the library. The trustees had spent nearly two years considering options for a renovation and expansion of the 108 year-old existing library building on West Main Street before deciding earlier this year, with encouragement from the selectmen, to focus on the option of a building a new library at North Quarter Park. Chinese president Xi Jiping , wearing oversize headphones, appeared on the cover of the French weekly Nouvel Obs on Dec. 4. “Are they spying on us?” asked the magazine. The same week, huge parabolic antennae showed up on the roof of an inconspicuous building four miles from Paris. Some people found the picture rather amusing and did not take this disclosure too seriously. But not everybody. 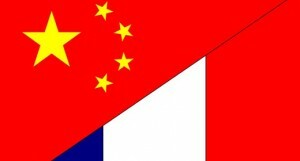 In fact, the way China is making inroads into the French economy is somewhat disturbing for many. This week, the International Monetary Fund announced that China surpassed the US as the largest economy in the world. The sheer size of this sub-continent, which represents over one fifth of the world population, is rather frightening for a small country like France. The economic strategy of China starts with the creation of partnerships with foreign companies, then a growing participation in their capital, and finally their acquisition. It is by absorbing the ideas, the know-how and the technology of older countries, that China was able to race to the number one slot. French officials and heads of private companies facilitate China’s grand design. Economic relationships between the two countries have existed for years, but what is new is its accelerating pace. In 2007, China had no high-speed trains. Then it turned to France (Alstom), Germany (Siemens) and Japan ( Shinkansen) to obtain the transfer of their technologies. Today China has the longest fast train network in the world. In 1992, Donfeng Motor Corporation and Peugeot-Citroen, the leading carmaker in France entered in a joint venture and started manufacturing cars in China. In March 2014, China Donfeng became an equal share holder of Peugeot-Citroen, thereby bringing to an end the 200-year-old family dynasty. France sold the idea of Club Med and the Shanghai-based Fosun company is currently fighting to win a bid for its acquisition. For the French, it feels like selling the family jewels when they see their prestigious wines of Bordeaux or Burgundy, along with their chateaux, being bought by the Chinese. But the most unsettling development so far just took place on Dec. 4. Emmanuel Macron, Minister of the Economy, signed an agreement with a Chinese consortium granting it 49.99 percent of the capital of the Toulouse airport. It is a disastrous business move by the French government. Toulouse is the country’s fourth largest airport. Extensive work has just been completed at a high cost. The airport has been a money-making undertaking, so why sell it for a dismal 308 million – the price of one Airbus? The answer is simple: France is under extraordinary pressure from Brussels to lower its deficit. It needs money. The new giant facility will handle 20 million passengers a year, multiplying by five the number of Chinese tourists visiting France, with direct flights to several Chinese provinces. Anybody, who has ever been to the “pink city” (pink is the color of the stone) on the banks of the Garonne with its quaint historical districts, will feel shocked by this decision. Besides, Toulouse is the European capital of aeronautics as well as an important center of nuclear and spatial research. A large Chinese presence in the neighborhood understandably makes some people nervous. 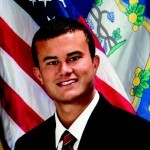 Sen. Art Linares (R-Westbrook) today sent to state regulators a list of nearly 800 people who have signed his online petition at www.senatorlinares.com in opposition to Connecticut Light & Power’s proposed service rate hike. On Wednesday (Dec. 17), the Public Utilities Regulatory Authority (PURA) is expected to finalize a $7.12 increase in the average monthly bill that Connecticut Light & Power sends out to its residential customers. The $7.12 hike would come on top of a Jan. 1 increase of $18.48, on average, for CL&P residential customers. Regardless of whether rates are hiked on Wednesday, Sen. Linares urged residents to continue to email state regulators at PURA.ExecutiveSecretary@ct.gov if they wish to express their concerns about rising costs. ESSEX— Voters Monday authorized up to 8.085 million in municipal bonding, approving five separate ballot questions in a low turnout referendum. A total of 257 of the town’s 4,654 registered voters turned out for the 14-hour referendum, along with two property owners who are not registered voters in Essex. 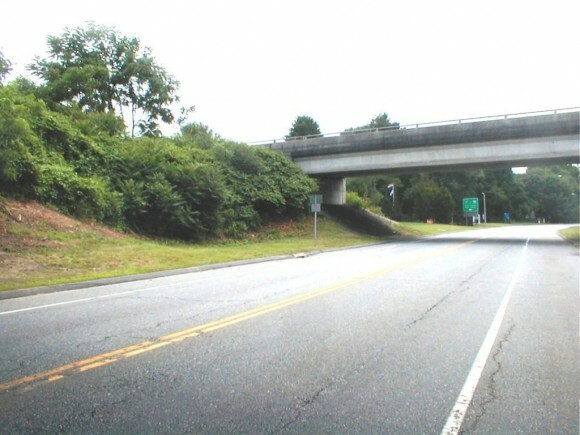 An authorization of $2,845,000 to replace the Walnut and Ivory street bridges in the Ivoryton section had the widest margin of approval, 221-38. A combination of federal and state funds will reimburse 80 percent of the cost of the Walnut Street bridge project, while the much smaller Ivory Street bridge will be paid for entirely by town bond funds. A $2,815,000 bonding authorization for improvements at Essex Elementary School was approved on a 193-64 vote. The improvements include replacement of the school roof, which will be eligible for partial state funding reimbursement, along with $600,000 for air conditioning at the 61 year-old school. Improvements to the town hall, including renovations to the land use offices, at an estimated cost of $1.3 million won approval of a 175-81 vote. Improvements at the town public works garage, with an estimated cost of $525,000, won approval of a 178-80 vote. Voters authorized bonding of $600,000 to purchase a new fire truck on a 186-71 vote. First Selectman Norman Needleman said he is pleased the capital projects initiative won voter approval. ” Thanks to everyone that came out and voted and thanks to the committee that did all of the hard work,” he said. The capital projects plan was developed over the past year by a building committee chaired by Selectman Bruce Glowac. The first bonds are expected to be issued by 2017 for a pay off over 20 years ending in 2037. 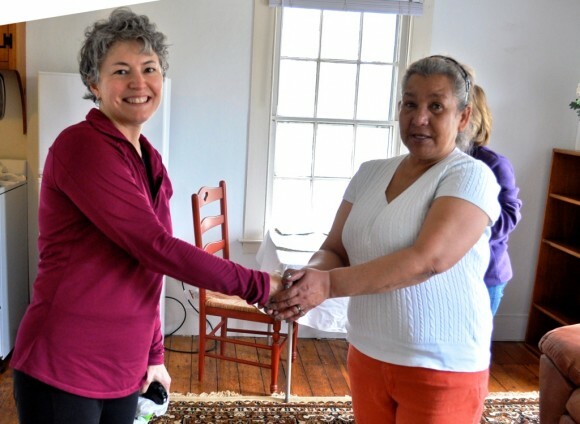 (l-r): Simply Sharing President and Founder Alison Brinkmann shares a special moment with a client from Gilead Community services after helping her move into her new home. ESSEX – When Simply Sharing President and Founder Alison Brinkmann decided to dedicate her time to a good cause and create an organization that would have a meaningful and lasting impact, she had no idea where that decision would take her. She did know that she wanted to create a collaborative effort, one with a simple, single mission. Through her involvement with the Community Foundation of Middlesex County, Brinkmann saw the potential to help homeless individuals and families in local communities by building a network of shared services and resources. After numerous discussions with leaders from area organizations and agencies, it was evident that there was a great need to secure furnishings and household items for those transitioning from shelters to sustainable and supportive housing. So with a leg up from the Community Foundation of Middlesex County, who provided fiscal oversight and funding, the Essex resident launched ‘Simply Sharing’ in April 2012 and has been on the move ever since. While the concept of collecting donated items for redistribution is not a new one, ‘Simply Sharing’ takes a more collaborative, personal partner approach on both ends of the process. The all-volunteer, non-profit organization welcomes material and financial donations from individuals and businesses and then works solely through other qualified non-profit agencies and organizations to identify clients that are in the most need of those donations. In addition to the furnishings and funds given by residents throughout Middlesex County, ongoing relationships with Bob’s Discount Furniture, Essex Meadows, Gather, and Realty 3 CT have built a solid foundation of additional resources. Working with Columbus House, Gilead Community Services, The Connection, Inc, Middlesex Hospital and Central Connecticut State University, Simply Sharing has helped well over 50 families get a fresh start in a new home. For more information on ‘Simply Sharing,’ visit simplysharing.org, email info@simplysharing.org or call 860-388-7390. ESSEX— The zoning commission has scheduled a Jan. 26 public hearings on separate proposals to expand and revise regulations for the residential life care zone on Bokum Road. The zone had been established in the 1980s to accommodate the Essex Meadows life care complex that is now the town’s largest taxpayer. Resident Marc Bombaci has submitted an application for a zone change from rural residential to residential life care for a 35.8-acre parcel that surrounds his 80 Bokum Road residence. 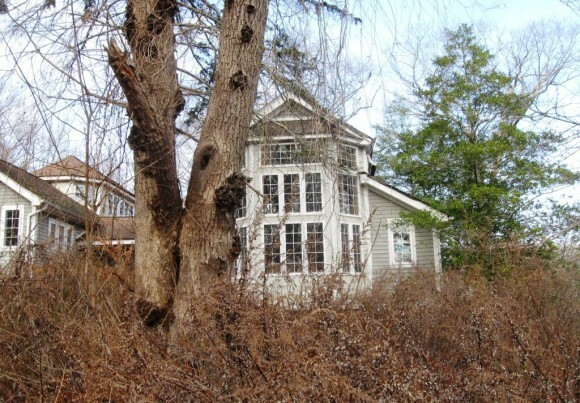 Sections of the property on the west side of Bokum Road abut land owned by Essex Meadows. Zoning Enforcement Officer Joseph Budrow said if the zone change is approved, Bombaci would have to secure special permit and site plan approval from the commission for any future residential life care or active adult community development on his property. The commission will also hold a public hearing next month on an application by Essex Glen LLC to revise the residential life care and active adult community regulations for a parcel on the opposite side of Bokum Road that was approved for a 55-unit active adult community development in 2007. The partnership never pursued the development plan that was approved in 2007. Budrow said the partnership, represented by lawyer Terrance Lomme, is preparing to submit a new application and plan for the property that calls for 22 units in separate buildings. Essex Glen LLC is requesting a revision to regulations for an active adult community that would change the setback requirements that are part of the current regulations. The change would reduce the front setback requirement from 80-feet to 40-feet, and the side and rear setback rule from 80-feet to 30-feet. Budrow said the change would accommodate a revised development proposal for the property with separate buildings. Lomme, who was re-elected last month as judge of probate for a nine-town region, had represented Essex Glen LLC during the 2007 application process. CHESTER— Voters at a town meeting Tuesday formally authorized acceptance of two state grants totaling $783,088 that will be directed to the revised Main Street East improvement project. Despite some talk of rejecting the grant funding over opposition to a now deferred element of the project plan, voters authorized accepting the funding on a unanimous voice vote. About 60 voters turned out for the town meeting, acting on the resolution after about 45 minutes of discussion. The vote comes two weeks after the Main Street Project Committee, and the board of selectmen, decided to scale back the project to eliminate plans for a continuous sidewalk on the north side of the street that had drawn opposition from some residents and at least one property owner fronting on the proposed sidewalk. There were concerns that opposition to the sidewalk, which would also require removal of two mature trees, would delay the project and lead to a possible loss of the state grant funding. The town has received two separate Small Town Economic Assistance Program (STEAP) grants, one of $450,000 and the other $333,088. First Selectman Edmund Meehan said the grant funds would cover most of the cost of the revised Main Street East Project that is now estimated at about $800,000. The project area is now limited to a 1,000-foot section from the intersection with School Lane west to the vicinity of the Laurel Hill Cemetery.The initial plan, including the north side sidewalks had a cost estimate of about $1.2 million. Meehan said the revised plan includes five new drainage catch basins in the vicinity of the Chester Post Office, new granite curbing, new sidewalks with a four-foot width that meets Americans With Disabilities Act standards, and additional lighting for the parking area at the entrance to the historic cemetery. Improvements to the street east from School Lane to the intersection with route 154 would be limited to milling and repaving, and possibly some repairs to a decaying state wall along the Chesterfields Health Care Center property on the south side of the street. Meehan said final details of the revised plan are now under review by the committee and project engineers, with a goal of putting the project out to bid for a start of construction in the spring. Meehan added that further improvements to the eastern section of the street would await future community decisions on whether to building a new library with other improvements to North Quarter Park on the north side of the street. The town was recently awarded a $1 million state grant for construction of a new library at the park, but it would cover only about a quarter of the total cost of a library building project. Voters also authorized the release of capital improvement funds, including $10,000 for two new police mobile radios and $6,934 for security enhancements at Chester Elementary School. The funds for the elementary school are a town match for a $59,000 state grant awarded to Regional School District 4 for security enhancements at the five district schools. The Chester Elementary School enhancements will include new interior and exterior cameras and a locked gate that would limit access from a wooded area on the west side of the school property. 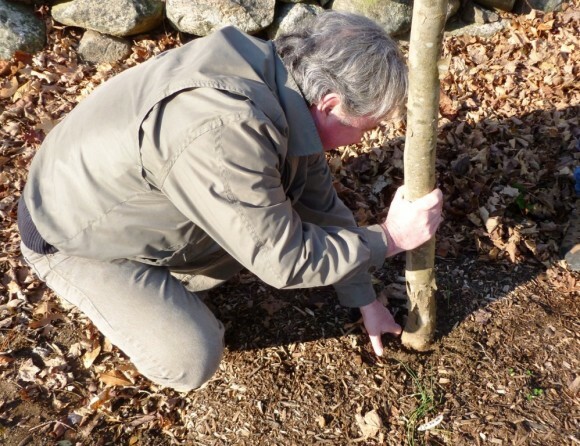 In the fall of 2014, the Essex Tree Committee, was awarded an America the Beautiful (ATB) grant of $1,186 to plant trees in an effort to advance “urban forestry” as outlined by the ATB grant program. These competitive grants are made available to municipalities and non-profit organizations by the Connecticut Department of Energy and Environmental Protection, Division of Forestry (DEEP). The funding comes from the USDA Forest Service State and Private Forestry Program and the Regional Greenhouse Gas Initiative (RGGI). 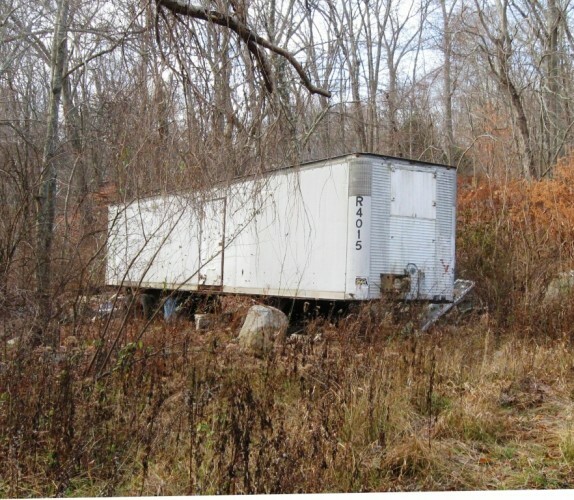 The Connecticut Department of Energy and Environmental Protection described the Regional Greenhouse Gas Initiative as “a cooperative effort among the states of Connecticut, Delaware, Maine, Maryland, Massachusetts, New Hampshire, New York, Rhode Island and Vermont to cap and reduce power sector CO2 emissions.” Because of these efforts by RGGI, DEEP Forestry expanded the grant criteria to focus also on reduction of energy use. Additionally, as a result of the recent storms, focus was placed on roadside tree management. Invasive insects such as the emerald ash borer and the Asian longhorned beetle were of great concern to the grant program as well. Of the seven categories outlined by the ATB grants (see DEEP Forestry website: www.ct.gov/deep/forestry for more information), the Essex Tree Committee concentrated on: planting or maintaining legacy trees, planting or managing trees to reduce energy consumption or increase carbon sequestration, and the management of roadside trees for storm resistance. A London Plane (sycamore family) at 168 River Road, Essex. The grant is a 50-50 grant in which the funding through the state program is matched by an equivalent contribution from the grant recipient. 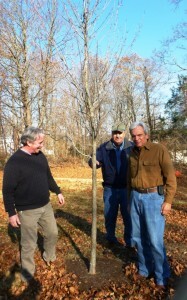 This matched contribution was made by the Town of Essex in the funding of the purchase and planting of the trees. The Essex Tree Committee would like to thank Fred Weber and Associates for their help in planting the trees and all the people who worked with the committee to select the appropriate sites for the trees. If you would like to make a donation to the Essex Tree Committee or discuss a tree memorial, please contact Augie Pampel at: augiepampel@att.net. CT Senator Art Linares (33rd District), and CT Representative Philip Miller (36th District), congratulate Roto Frank of America, Inc. at the celebration of their 35-year presence in North America. On Thursday, December 4th, CT Senator Art Linares (33rd District), and CT Representative Phil Miller (36th District), congratulated and honored Roto Frank of America, Inc. of Chester at the celebration of their 35-year presence in North America. They presented Roto with an Official Citation from the General Assembly during the event. The festivities also included a retrospective of the company’s growth and development by Skip Branciforte, an employee who has been with Roto Frank of America since its beginning, as well as a catered luncheon and gifts for all personnel to commemorate the occasion. 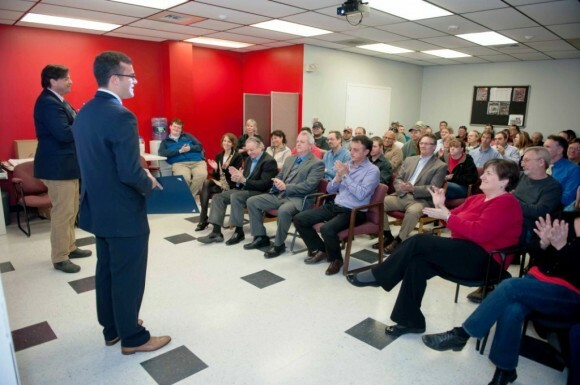 The Chester, Connecticut facility houses Roto’s administration, engineering, manufacturing and distribution departments for their North American and European hardware. Roto Frank of America and Roto Fasco Canada combined form Roto North America, with over 120 employees, and are subsidiaries of the world’s largest manufacturer of OEM window hardware, Roto Frank AG. “We are thrilled to celebrate this significant milestone in our company’s history, and we realize that this achievement would not have been possible without all of the dedicated Roto employees, customers, partners, and shareholders who have helped us along the way with their loyalty, integrity, and commitment,” says Chris Dimou, Roto North America’s President and Chief Executive Officer. About Roto Frank of America, Inc.: Founded in 1979, Roto Frank of America, Inc. (www.rotohardware.com) has a long tradition of providing manufacturing solutions to OEMs in the window and door industry. The company specializes in window and door hardware, such as Casement/Awning, Single/Double Hung, Tilt & Turn, Sliding/hinged Patio and Euro. 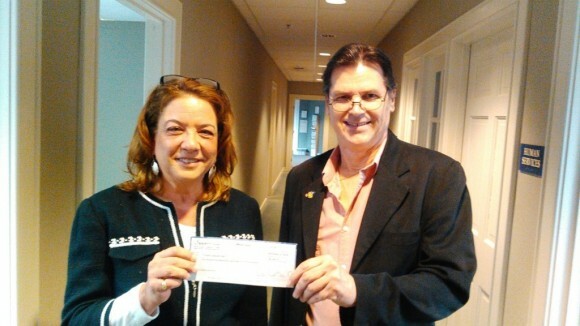 On November 24, 2014 Gary Torello, the chairman of Chester Rotary’s Liberty Bank Thanks Giving Dinner Drive, presented a check in the amount of $2,407.51 to Rosie Bininger, Director of Human Services for the town of Chester, CT. Torello along with other Chester Rotarians raised funds throughout the month prior to this year’s Thanksgiving holiday in order to feed a growing number of Chester families on Thanksgiving Day. Funds not used to directly provide Thanksgiving dinners to area residents will be used to help stock the Chester Food Pantry in the coming months. The Chester Rotary was one of 33 Rotary Clubs participating in the annual Liberty Bank/Rotary Club Thanksgiving Dinner Drive. While Liberty Bank had promised matching funds in the amount of 20% of funds collected by Connecticut Rotary Clubs, a last minute surprise by Liberty Bank President and CEO, Chandler Howard, increased it to 25 cents per dollar at the conclusion of the drive. All total, Connecticut Rotary clubs collected $167,476.11 which together with The Liberty Bank Foundation’s $41,869.03 in matching funds makes for a grand total of $209,489.82. Essex resident Robert Kern has written a letter to State Senator Art Linares, complaining that Essex’s new telephone and Internet carrier, Frontier Communications, has raised rates in Essex, when it promised not to do so, after it had acquired local service from AT&T. Promptly responding to Kern’s complaint, the Senator wrote on December 9, “I am bringing your complaint to the attention of state officials.” Also, the Senator advised Kern that, “A Dec. 22 public meeting has been scheduled with executives of Frontier Communications regarding complaints like yours,” and that the meeting would include a public comment section. The December 22 public meeting will begin at 9:30 a.m., and it will be held at the offices of the Public Utility Regulatory Authority at 10 Franklin Square in New Britain. The Senator also wrote to Kern, “To file a complaint about Frontier service with the state Department of Consumer Protection, send an email to dcp.fraud@ct.gov,” that includes your contact information and the particulars of your complaint. . I find Chester a very interesting place to live and would live nowhere else. Over the years I have moved away to find myself returning as soon as I can. You are free to raise roosters, shoot a gun and not have your trees cut down (without due course) and if someone tries to change these things there is a huge public outcry. These things are important to some but what is important to me and should be important to all is that our Library is not able to serve every person. This coming year will be the 25th anniversary of the passing of the Americans with Disabilities Act of 1990. Chester has failed to address this issue within our Public Library to conform to this act in the past 25 years! Where is the outcry! We now have the opportunity to address this with the recently acquired grant from the State of the Connecticut that will provide partial funding for a new library. Fact: The current Chester Library does not address handicap accessibility. Fact: The Town of Chester does not own the property on which the current library stands, so investing in the current building is not a solution. Of course there are many other valid reasons why the library needs updating and the need for a community center, but first and foremost the primary issue needs to be addressed. There is no longer the need for any discussion, it’s a simple fact. Unfortunately this means that we as a community must provide the necessary remaining funding either through private donations or tax increases, but not doing anything is no longer an option. It is our social responsibility and the time has come address it once and for all. ESSEX— Voters Monday adjourned a town meeting on a proposed $8,085,000 bonding plan without discussion, setting the stage for an all day referendum on Dec. 15 on a plan that is expected to result in an increase in property taxes beginning in 2017. About 40 residents, nearly half of them volunteer firefighters, turned out for the required town meeting on a plan that was first presented at a public hearing on Nov. 19. But the meeting was quickly adjourned to the referendum without questions or discussion. No one expressed opposition to any of the components of the bonding plan that will be presented for approval as five separate ballot questions in the referendum. The bonding plan, developed over the past year by a building committee chaired by Selectman Bruce Glowac, was first presented at a Nov. 19 public hearing.. The plan includes two bridge replacement projects in the Ivoryton section and replacement of the roof at Essex Elementary School, which were identified as priorities at the start of the process, along with several other projects. The components, each presented as a separate yes-or-no ballot question, include $2,845,000 for replacement of the Walnut and Ivory street bridges, $2,815,000 for improvements at the elementary school, $1.3 million for improvements at town hall, $535,000 for improvements at the town public works garage, and $600,000 for purchase of a new pumper fire truck. The two bridge projects and the school roof replacement are eligible for state or federal funding reimbursement of $2,055,000, leaving town tax payers to finance bonding of up to $3,030,000. The elementary school project also includes $600,000 for air conditioning at the school. The town is expected to use bond anticipation notes to fund some of the initial projects, with the full 20-year bonds expected to be issued in late 2016 or early 2017. The highest year for debt service payments is expected to be 2017-2018, when the bonding plan is expected to require a 0.49 mill increase in the property tax rate that is currently set at 21.99 mills. Town Finance Director Kelly Sterner said at the Nov. 19 hearing the 0.49 mill increase would represent about $147 in additional tax for a residential property assessed at $300,000. Debt service costs would begin to drop in 2021, falling off more steeply beginning in 2027 for a final pay off of the bonds in 2037. Polls will be open Monday at the town hall auditorium from 6 a.m. to 8 p.m.
France and the rest of Europe look at the United Kingdom with some envy: the UK is currently enjoying a three percent growth in its economy, unemployment as low as six percent, a paired down number of civil servants and the dynamism of the City as a world financial center. No wonder young entrepreneurs and students are flocking to Britain from the continent. This week the spotlight was on Prime Minister David Cameron. On Nov. 28, he gave a resounding speech to an industrial audience in the West Midlands. The main thrust of his message was to stress the inability of his country to absorb hundreds of thousands of refugees and job seekers. He announced that, if reelected in May 2015, he will renegotiate the terms of the UK’s membership of the European Union (EU). In the case of refusal, he would organize a referendum on “Brexit” (the colloquial expression for British exit). To control immigration, his demands include the expulsion of immigrants still jobless six months after their arrival in England and a four year waiting period for new immigrants before they can receive benefits, tax credits or social housing . According to the “Schengen Zone Agreement”, Rumania and Bulgaria, which joined the European Union in 2007, had to wait until Jan. 1, 2014, to enjoy full rights to travel and apply for work within the Schengen space. This explains the spectacular increase in the number of immigrants from those countries to England during the past nine months – increases respectively of 468 percent of Rumanians and 205 percent of Bulgarians. Government corruption, hard to integrate “Romas” and a lagging economy in both those countries explain why other EU members are reluctant to open the flood gates too soon. This week David Cameron sent a special message to the Polish Prime Minister, Ewa Kopacz, to reassure that his demands would not apply to job seekers from her country. On Nov. 25, the Pope, speaking in the EU Parliament in Strasbourg, admonished the Europeans for being too egoistic and urged them to coordinate their immigration policies. The Mediterranean, he said, should not become a cemetery. Stressing human dignity, the Pope puts immigration at the center of his message. The choice of Lampeduza as his first trip out of Rome was symbolic. David Cameron is under pressure from the Euro-skeptics and the conservative UKIP (UK Independence Party). It is clear he is ready to moderate his demands since he does not want to sever links with the EU. The desire to negotiate is also strong on the other side of the English Channel. Efforts to reach property owner, John Malloy, III, were unsuccessful. I write to clarify an important element of the story reported in this publication’s December 5 feature, “Essex Conservation Commission to Hold Off Lethal Trapping of Beavers,” which seems to have triggered local jubilation. While I have Essex First Selectman Norm Needleman’s personal assurance that he, concerned citizens, and the Essex conservation commission are now “all on the same page” and that the commissioners have pledged to examine non-lethal beaver management alternatives, only on-the-record rescission of the commission’s earlier trap/drown decision guarantees that no physical harm will come to the beavers. The conservation commission has the full authority to act as it deems appropriate, and it has left open the Final Solution. Talk is cheap, and if the public heat abates I have no confidence — based on its legacy — that the conservation commission can be trusted to act diligently in the public interest, and with the utmost transparency. Beavers were trapped and drowned by closed-door decision several years ago. In the commission’s meeting on December 4, the vice commissioner asserted, for example, that death by drowning is “instantaneous” — a statement that is patently false, ignorant, and dismissive of a legitimate animal welfare concern. The overarching ethical issue is that beavers, which today’s science recognizes as beneficial cornerstone species of the ecosystem, are simply behaving naturally in a preserve that taxpayers established to safeguard flora and fauna from mankind’s destruction. I urge your readers to monitor this issue closely and to continue pressing for definitive, on-the-record rescission of the conservation commission’s November 6 trap/kill decision. The conservation commission agreed Thursday to defer any possible lethal trapping of beavers in the ponds at Viney Hill Brook Park after hearing objections from dozens of residents at the panel’s regular meeting. More than 80 residents turned out for the meeting of the commission that supervises the town’s open space lands, with most voicing opposition to the decision at a Nov. 6 meeting to pursue the trapping. The commission in recent months has been discussing damage caused by beavers to trees and trails at the 90 acre park. The commission had authorized some lethal trapping of beaver at the park in March 2011, a decision that drew objections from some residents, but not the public outcry sparked by the latest consideration of the trapping option. About two dozen residents, including some children and teenagers, spoke in opposition to the option of lethal trapping. Many called the trapping, in which beavers are restrained and held underwater until drowning, as cruel and inhumane. Paul Leach said the method of removal “is unkind and therefore unacceptable,” while Scott Konrad maintained it take the animals several minutes to expire during the trapping. Several residents urged the commission to further investigate options for controlling beaver activity that do not include lethal trapping, with some offering to contribute money to pay for any devices or piping that could control the beaver without trapping. But some residents, including parks and recreation commission members Jim Rawn and Robert Russo, contended too much beaver activity could impact water quality in the larger of the two ponds that is used as a town swimming area. Rawn said the swimming area was closed for a period in 2001 due to contamination of the water from animal feces, while also suggesting that beaver activity could undermine the man-made dams that help contain the two man-made former sand and gravel quarry ponds. After hearing more than 90- minutes of public comment, commission members, some reluctant, agreed to hold off any lethal trapping this year to investigate other options for controlling and limiting damage caused by beaver activity. State rules limit beaver trapping to the colder weather months. First Selectman Norman Needleman, who joined commission members at the table as an ex-officio member, urged the commission to spend additional time exploring other options for beaver control. Needleman also offered the services of the town’s consulting engineer, Robert Doane, to help establish whether the beaver activity truly poses any threat to the structure of the two ponds. Voters will be asked at a town meeting Tuesday to formally accept two state grants totaling $783,000 for the Main Street East reconstruction project. The meeting begins at 7 p.m. in the community room at town hall. The required town meeting action comes after the board of selectmen and the Main Street Project Committee approved a change in the long-planned project that would limit most improvements to the section of the street from the intersection with School Lane west to the Laurel Hill Cemetery, while eliminating plans for a continuous sidewalk on the north side of the street that had drawn opposition from some residents. One factor in the now deferred plans for a north side sidewalk was a preliminary plan to construct a new library in North Quarter Park, a plan for which the town was recently awarded a separate $1 million state grant. But when the board of selectmen discussed the project at a meeting Tuesday, some residents voiced continuing objections to both the revised Main Street plans, and the idea of building a new library at North Quarter Park. Christopher Moore raised concerns about town costs for both projects, while Caryn Davis questioned the need for a library. “It’s not as if we don’t have services,” she said. Cary Hull, a library supporter, responded to the comments by noting the award of the state grant, which must be directed to a town approved library building project within three years, is only the first step. ” We realize our work is just beginning for a library that is accessible to everyone in the community,” she said. First Selectman Edmund Meehan said plans for a library project are in the early stages, and would require both private fundraising and possible town bonding because the $1 million grant would cover only a portion of the cost of a new library. But Meehan added that failing Tuesday to accept the two state Small Town Economic Assistance Program (STEAP) grants awarded for the Main Street Project would likely mean a loss of the grant funding and leave town taxpayers responsible for all of the expense of any improvements to Main Street. “If we keep delaying this we have a high risk of having that money pulled back,” he said. Michael Joplin, chairman of the Main Street Project Committee, said the panel needs to complete the revised plans for the Main Street East Project soon to allow the project to be put out to bid for a start of construction by the spring. “We have to move this along,” he said. Joplin, at a Nov. 25 meeting, had urged the committee to scale back the project plans out of concern that controversy over the north side sidewalk would delay the project and lead to a possible loss of the grant funding. The board of selectmen will take no further action on the issue of a residential target shooting ordinance that was requested by a group of Wig Hill Road residents living near an undeveloped property that is used for target shooting. The board voted unanimously Tuesday on a motion by Selectman Larry Sypher to take no further action on an issue that had drawn dozens of target shooting enthusiasts and gun rights supporters to an Oct. 21 public information meeting. The issue had been discussed further when more than two dozen residents turned out for the board’s Nov. 18 meeting. The nine-acre Wig Hill Road property that sparked the public debate on the issue is owned by Deep River resident Warren Elliot and has been used as a private target shooting range for several years. A group of residents living near the property, raising concerns about noise and public safety, had submitted a petition last summer urging the selectmen to consider a town ordinance that would prohibit target shooting on properties in a residential zone.. The idea of an ordinance, which would have required approval from voters at a town meeting, was strongly opposed by most of the residents that turned out for the Oct. 21 information meeting. From left to right, Leigh-Bette Maynard, manager of Liberty Bank’s Essex and Old Saybrook offices, Patty Dowling, Executive Director of The Shoreline Soup Kitchens & Pantries, and Skip Marquardt, Raymond James Financial Services and SSKP Board of Trustee member. The Liberty Bank Foundation has awarded a $5,000 grant to the Shoreline Soup Kitchens & Pantries (SSKP) to support the purchase of food from the CT Food Bank. 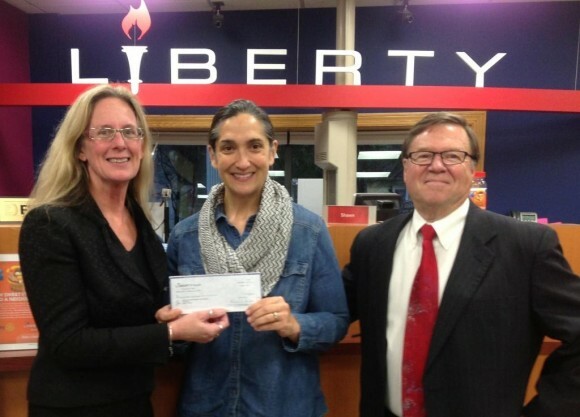 “SSKP is so grateful for the generous support we receive from the Liberty Bank Foundation. This donation helps assures that people in need on the shoreline have a place to turn for food and fellowship. With these funds specifically we will be able to distribute enough food at our pantries for over 13,150 meals. On behalf of all those we serve, I thank The Liberty Bank Foundation for supporting our local neighbors in need,” said Patty Dowling, executive director of SSKP. Since its inception in 1997, the Liberty Bank Foundation has awarded almost $7.9 million in grants to nonprofit organizations within Liberty Bank’s market area. The foundation seeks to improve the quality of life for people of low or moderate income by investing in three areas: education to promote economic success for children and families; affordable housing; and nonprofit capacity building. Along with its grantmaking, the foundation strives to foster the convening and collaboration of nonprofits, funders, business, and government to address community issues. Founded in 1989, SSKP provides food and fellowship to people in need and educates the community about hunger and poverty, serving the Connecticut shoreline towns of Essex, Chester, Clinton, Madison, Old Saybrook, East Lyme, Lyme, Old Lyme, Killingworth, Westbrook and Deep River. Established in 1825, Liberty Bank is Connecticut’s oldest mutual bank, with almost $3.5 billion in assets and 48 banking offices throughout the central, eastern, and shoreline areas of the state. As a full-service financial institution, it offers consumer and commercial banking, home mortgages, insurance, and investment services. Rated outstanding by federal regulators on its community reinvestment efforts, Liberty maintains a longstanding commitment to superior personal service and unparalleled community involvement. Look at the “front door” to Essex, Conn.: Tacky, patch-painted bridges and untamed brush. Hardly welcoming enticements for visitors, and in sharp contrast to the beautiful center road “gardens” maintained by our beloved, hard working, Ancient Order of Weeders. There are two issues here: (1) refurbishment of the bridges themselves and (2) upkeep of the land around the bridges. 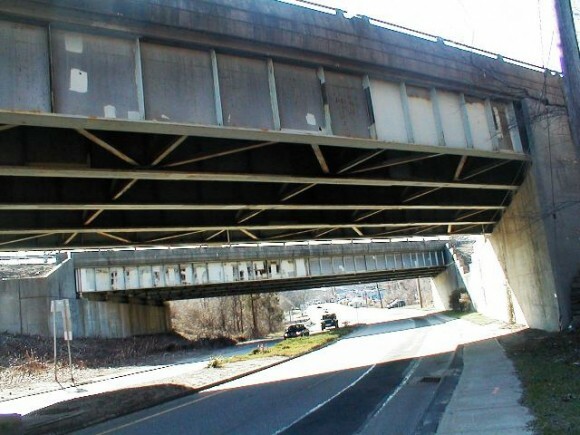 result in this: due to budget constraints, repainting these bridges (lead paint is huge issue) will only happen when the bridge needs major structural rehab. However, were there grafitti all over the bridges, the DOT could indeed get out and cover it. Which is to say, the DOT could make the bridges look good without the necessity of the total overhaul. But will not. The solution is simple! All I need to do is to get out with long-armed spray paint cans (would you join me?) and spell out something gross. Just kidding. Underneath the Rte. 9 bridge — not a pretty picture. I challenge the so-called “budget constraints.” While the DOT has no funds to fix the ugly Essex bridges, it does indeed have budget to mow down, — remove — all greenery in a large divider section on Rte. 9 at Exit 2. You’ve surely noticed it. Inquiries with State Rep. Phil Miller indicate the reason for the mowing was that there were invasive trees in that area. So when or why does the DOT study and determine the quality of greenery on public lands? Connecticut has a Forestry Dept. within the Department of Environmental Protection that studies and has funds to control such problems. 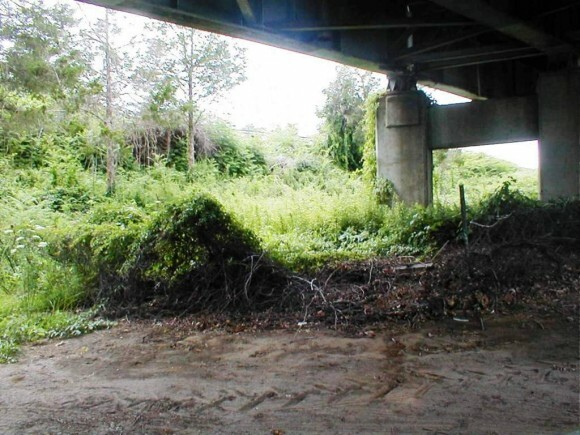 The DOT has funds for invasive tree eradication, but not for tidying up ugly bridges. 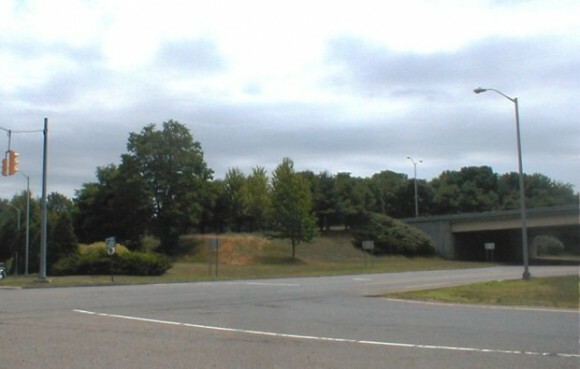 A view of the Old Saybrook exit. As you can see, there is something awry here. But, as it appears hopeless that such wasteful duplications in our State Government will be fixed soon, if ever, it seems that the only way Essex can get its ‘Front Door’ at Exit 3 spruced up, is by a special allowance to the DOT from State funds specific for “Bridge Beautification.” I submit that as there are State Small Town Economic Assistance Program ( STEAP) funds granted for upgrades to replace crosswalks, tennis courts and parking lots, there surely are funds available to relieve Essex of its “Tacky Town” appearance. I-95’s Exit 70 offers a beautiful gateway to Old Lyme. (2) In contrast to Essex’s bridges and surrounding areas, look at the expansive, elegant and well-mowed plantings at I-95, Exit 70, Old Lyme. I hereby ask of the DOT to give Essex equal treatment. And I hereby request Essex’s First Selectman Norm Needleman to request a State grant to the DOT to speed along this project. In addition, I hereby request our state representatives … Phil Miller and Art Linares … to assist in pushing these projects through. 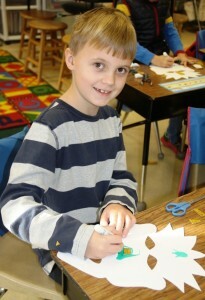 Second grader Lyle Pitman works on his Haitian mask. Second and third grade students at the Essex Elementary School were recently treated to Haiti Day, as part of the Justus W. Paul World Cultures program, funded by the Essex Elementary School Foundation. They learned about Haitian life and culture by making masks and metal art, as well as listening to music performed by the Carnival Trio. The children will also study India and China. In early December, the Essex Elementary School Foundation (EESF) kicked off its annual appeal. In addition to the World Cultures Program, this not-for-profit, volunteer organization also provides funds for enrichment programs, such as an iPad lab, a talent show and a mathematician-in-residence. The United Church of Chester is currently looking for a Christian Education Director. See the church website at uccchester.org or email unitedchester@sbcglobal.net or call 860-526-2697 for a job description. The church’s mission states, “No matter who you are or where you are on life’s journey, you are welcome here at the United Church of Chester, an Open and Affirming Church, and a member of the United Church of Christ.” Each member has the undisturbed right to follow the Word of God according to the dictates of his or her own conscience, under the enlightenment of the Holy Spirit. Visit for Sunday morning worship at 10 a.m. or come by the office Tues-Fri 9 a.m.-1 p.m. to find out more about the church. It’s distressing to read the several letters about the extermination of the beavers at Vineyard Hill Brook Park. You can be sure the “remedy” chosen to remove the beavers from the park is a last resort, not the first choice, of the park managers. The unfortunate reality is that water in which beaver resides is not healthy, is in fact dangerous, for humans, especially young humans. Maybe the remedy would be to allow a pond to be developed downstream, somewhere, or some such; there just aren’t a lot of places to which they can be removed any more. The reason Essex has the park is to allow people to swim and play in a potable water body, not just for fun, but also to learn a little about being able to survive in water. We allow the killing of other animals which are a threat to us, and though it is not my own desire to do this, no one seems to have a better remedy. One could describe the exhibit as intimate. Only 80 paintings hang in the small rooms of the Musée du Luxembourg, some of them never seen before. The style is familiar. the colors are soft, the scenes are peaceful — we are in the Impressionists’ world to meet old friends: Monet, Manet, Degas, Sisley, Pissarro, Eugene Boudin, Renoir, Berthe Morisot, Mary Cassatt. 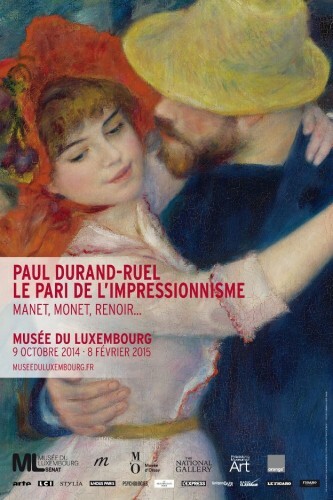 The title of the exhibit is, “Paul Durand-Ruel. The Impressionist Gamble – Manet, Monet, Renoir,” and it tells the endearing story of the first art dealer in history … and also one of the most influential. The artwork is stunning: in “Le Pont à Villeneuve -la-Garenne,” Sisley creates the fluidity of the water by using multicolor brush strokes and in Renoir’s dance scenes, 1883, couples twirl around happily, women’s eyes bright, their ruffled dresses contrasting with the dark suits of their older escorts. “Liseuse” by Monet shows a young woman sitting on the grass, enveloped by vegetation, spots of light dots her pink dress and in “Le Foyer de la Dance,” Degas’ dancers warm up, others are stretching, while, in the foreground, a little old lady, slouching in a chair is reading a newspaper. Nearby another painting is identical, except for the empty chair — the little old lady is gone. The story behind the artwork is equally fascinating. Durand-Ruel (1831-1922) became an art dealer by accident. Attracted to a military career, he entered Saint Cyr (equivalent of West Point) but renounced for medical reasons. He was struck by the paintings of Eugene Delacroix exhibited at the 1855 Exposition Universelle (World Fair). He became fascinated by the artists who were refused access to the official Salon of the Academy of Fine Arts because of their innovative techniques. Left alone after the his wife’s death, he turned his art dealership into a family business with his five children. He opened galleries in London, Brussels, New York and later, Berlin. In 1874, a group of young artists – who were given, at that time, the collective term of ‘Impressionists’ – showed their work for the first time together in the studio of photographer Nadar. In 1886, the American Art Association invited him to organize an exhibit in New York. It was a success and became the first official recognition of the Impressionists. One cannot help compare the story of such a life to the speculation around art today and to the giant art fairs (like Art Basel) when intermediaries are commissioned by owners with deep pockets. 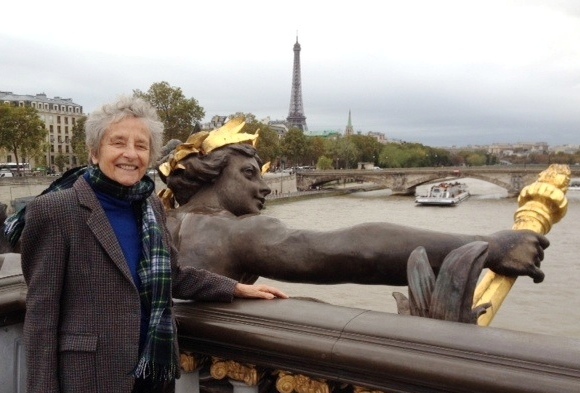 The exhibition at the Musée de Luxembourg continues through Feb. 8, 2015.